Rare Essence has been waving the flag for go-go music for four decades. So, what is go-go music? Not to be confused with go-go dancing or go-go boots, go-go music is an offshoot of funk that combines elements of R&B, hip-hop and blues. It's built live thanks to the audience and the band feeding off one another's energy. Fans frequently sing lines back during the show. And those shows are at their most intense in Washington D.C., go-go's birthplace and home. There, Chuck Brown, leader of The Soul Searchers and the man credited as the godfather of the genre, created a vibrant culture of go-go in the 1970s. Rare Essence took Brown's original idea, "cleaned up the sound" and messed with the beat a bit to invent what you will hear today. Over the last four decades, Rare Essence has released dozens of records with a good number of them being live albums because that's when the party really gets going. And the party doesn't stop – one song blends directly into the next as you are about hear, even in this pared-down set. 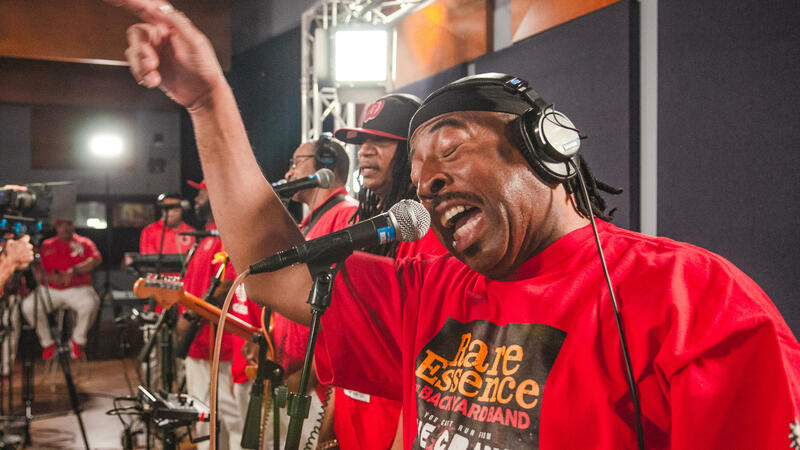 Members of Rare Essence are joined in the studio by D.C . native DJ Kool, who is also on the band's latest album, 2016's Turn It Up. Let's get started with a set of go-go funkiness. Listen in the player.